This relatively new release in from the well know ‘Jury’ selection. Black Tulip is very dark flowering magnolia with attractive goblet shaped flowers that are around 15 cm (6 inches) across and is especially well formed. 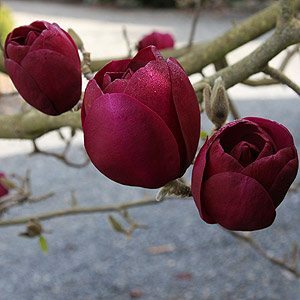 Readily available for sale, Magnolia ‘Black Tulip’ makes an excellent choice as a feature tree in any garden, the deep red to near black flowers (picture right) appear on bare stems in early spring are followed by nice green foliage. A mature specimen will reach around 12ft – 15ft tall (4-5m) in time. This particular cultivar seems to flower well at an early age, an added advantage. The Black Tulip Magnolia could be grown in a large container if required, however it probably performs best in the ground in a humus rich moist but well drained soil. We suggest a sunny position which offers some protection from strong winds especially if you want the flowers to hold form for as long as possible. A good idea to stake when young. When planting water in well with some liquid seaweed fertiliser. Some protection from hot afternoon sun could be ideal in warmer climates.